As Russi M Lala, veteran journalist and author walks into the Princess Victoria Memorial Gymkhana near Churchgate, delighted cries of “Russi, Russi” greet him from all sides. People walk up to him and shake his hand. He answers them all with an old-world friendly formality that seems to be characteristic of him. It is difficult to associate this lively 78-year-old with age or disease. And yet for Lala, his battle with cancer has been the turning point in his life. “I was in the lift one day, when I felt the lump on my neck,” he says. Lala was diagnosed with Non-Hodgkin’s lymphoma, but he was not disheartened. JRD Tata, whose biography has been written by Lala, was the person who sent him abroad for treatment. “My confidence stemmed from my ignorance,” he recalls. “I was so stupid and busy that I did not realise the gravity of the situation. But when the treatment started, it was horrible.” Lala gives credit to Freny, his wife, for having been his strength and support during those trying times. To this day, the love and affection that he feels for her is visible. He revels in pampering her and being attentive to her every need. “When cancer strikes, your approach to life and your own personality come alive. You focus on what you are within yourself,” he says. “The disease was an interruption in the busy hum of my life.” His positive attitude not only got him through the ordeal of the disease, but also inspired others around him. Vandana Gupta, another cancer patient, who met Lala during the course of her treatment, had completely lost hope in life. Her conversations with Lala gave her back her zest for life and she went on to start a support group for cancer patients called ‘V Care’. Lala later wrote Celebration of the Cells, which is a book about his battle with the disease. The book is in the form of letters to Vandana Gupta. However, the book that he is best known for is Beyond the Last Blue Mountain — The Life of JRD Tata. Lala considers himself quite fortunate for having got the opportunity to interact with JRD, and he is obviously very influenced by him. “He was a great human being. To have known him and been with him was a source of refinement,” Lala says. He recounts how while working on the biography, he had told JRD, “I am neither going to call you good nor great. Let the reader judge,” to which JRD responded with “That is as it should be”. Lala started his career as a journalist with newspapers like the March and the Current in 1948 at the age of 19. “At that time, there was hardly any competition and very little advertising. We refused to print cigarette and liquor ads,” Lala observes. He has seen the field grow over the years and feels that journalism today is lighter and more interesting. He became the manager of the first Indian publishing house in London, the Asia Publishing House, and by 1964, he had co-founded the Himmat Weekly with Rajmohan Gandhi. “I was the only investigative journalist then,” he says. 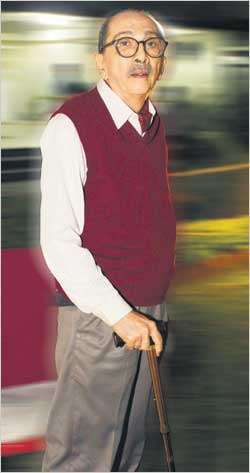 His work in the Himmat Weekly was highly appreciated by the then director of the Tata Company, SA Sabavala, who invited Lala to write about the Tatas. This marked the beginning of his association with the company. Lala liked meeting people. “As an editor, I would meet people very often, but now, I am unable to go out frequently due to old age and illness,” he says. He wrote about 26 personalities, whom he had met during the course of his life and career in his second book, titled, Touch of Greatness: Encounters with the Eminent. Vinoba Bhave, Mother Teresa, Dalai Lama, Jayprakash Narayan and many others he met have inspired him. Once with the Tata company, he served as director of Sir Dorabji Tata Trust for almost 18 years. He helped in setting up the JRD Tata Centre of Ecotechnology in Chennai and the Sir Dorabji Tata Centre for Research in Tropical Diseases. At present, he is the Chairman of the Centre for Advancement in Philanthropy in Mumbai, an organisation that assists other philanthropic institutions by advising them on various issues like legal matters, fund raising and so on. Currently, he is working on his next book, The Role of Purpose in Life. Did you do this recently? I personally have great admiration for Mr. Lala. My encounters with him have always inspired me. Good job…! !